Trump Budget Plan Relies On Optimistic Growth Assumptions, Analysts Say : The Two-Way President Trump's proposed budget released Tuesday rests on a key assumption: The economy will grow much faster than it has in recent years — and at a more robust pace than most analysts predict. White House Budget Director Mick Mulvaney speaks to the reporters about President Trump's proposed budget on Tuesday. Trump's proposal for fiscal 2018 will seek to balance the federal budget over the next decade by making deep cuts to safety-net programs such as Medicaid, food assistance and disability benefits, and by trying to goose economic growth through deregulation and tax cuts. Those policy proposals already face opposition, even from some members of the Republican Party. One of the overarching debates, however, has to do with underlying economic assumptions made in the budget, which are also coming in for heavy criticism. The proposal promises to close the budget deficit by 2027 by cutting federal spending by $3.6 trillion overall, but it does so by assuming an economic growth rate that is much higher than what the Congressional Budget Office projects it will be. The administration sees roughly $550 billion of that offset coming from "assumed economic growth," says Marc Goldwein, senior policy director for the Committee for a Responsible Federal Budget. "I say 'assumed economic growth,' because they don't show us any math of how they get there." The White House's assumption is that economic growth, as measured by gross domestic product, will reach 3 percent annually by 2020, and then remain there. "It's far above anyone else is projecting," Goldwein says. U.S. growth during the first quarter was 0.7 percent, and for all of last year it was 1.6 percent. The CBO projects U.S. economic growth will average nearly 1.9 percent over the next decade. Other estimates range between 1.6 and 2.1 percent, but no economist, Goldwein says, has arrived at figures close to the 3 percent the White House is projecting. The White House, however, says the naysayers have it wrong. 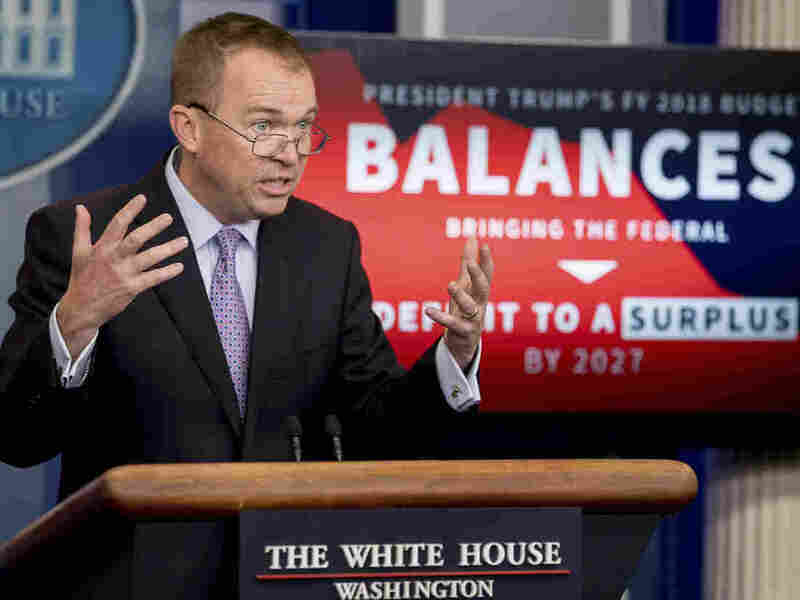 "The focus is sustained 3 percent economic growth," said White House Budget Director Mick Mulvaney said during the unveiling of the president's budget. Critics who dispute the possibility of that, he said, are wrongheaded. "It used to be normal. Ten years ago, it was normal." He calls estimates below 1.9 percent annual growth "a pessimistic look at what the potential for this country and for what this country's people is." Mulvaney argued the administration considered how various policies and deregulatory measures would help increase economic output, lifting the revenue base and helping to achieve a balanced budget. The Committee for a Responsible Federal Budget's Goldwein calls that magical thinking. The 1990s saw a boom with about 3.5 percent growth, but he says that was a rare circumstance — during which baby boomers were in their peak working years. Things have changed. "We have an aging population, and that means significantly lower labor-force growth and it also means lower productivity and lower investment," Goldwein says. "The numbers just don't add up." Some of the administration's proposals, if adopted, could help boost economic growth, he says, including deficit reduction, and helping more people collecting disability insurance benefits go back to work. But those would contribute only slightly to economic growth and wouldn't be enough to reach a 3 percent rate. There are other assumptions and omissions in the president's budget that Goldwein finds problematic: One is that it assumes non-defense spending will continue to decrease to roughly half the current levels. The budget also does not include the tax-reform plan the administration has touted, which most estimates figure would add more than $5 trillion to the budget. "That's nowhere to be found in this budget." The administration is double counting its economic benefits, says Jason Furman, chairman of the Council of Economic Advisers under President Barack Obama, now a senior fellow with the Peterson Institute for International Economics. "The administration has said that economic growth will pay for their tax cut, and now in this budget, economic growth will pay to lower the deficit, and you can't have both," Furman says. Moreover, the administration's budget assumes that it will continue to collect revenue at today's tax rates — which it has repeatedly said it intends to lower. "So, it's a mistake. It's wrong. If a central policy is tax cuts, you should include tax cuts in your budget and account for them." Furman also says it's been nearly a decade since the last recession, and just about every economist believes another is inevitable over the next decade. But because the 3 percent growth projection is an average, that would mean the economy would need to grow even faster in some years.